Rosemary Restaurant harmonically combines the elegant atmosphere and the modern minimal aesthetics with the amazing flavors of the Mediterranean Cuisine. You will find it in the traditional and quiet village of Pyrgos, up to the hill, next to the Castle, overlooking the Aegean Sea! Rosemary opened in summer 2015 and is housed in a beautiful building, which is actually protected by the Byzantine Institution. Every conversion needed during its renovation, was made according to the local architectural style and with great respect to the environment of the settlement and the island in general. The impressive, yet simple, space, along with the magnificent view from the terrace, which is overlooking the Caldera and the blue waters of the Aegean, predispose a romantic dinner… The dishes are based on the traditional Greek and Mediterranean Cuisine. They are all made of pure ingredients, coming from local producers. So, you will have the chance to taste Santorinian fava, the characteristic cherry tomatoes of the island, but also lamb from the island of Naxos, cheeses from other Cycladic Islands, and many more! The talented chef creates culinary masterpieces that are served in the most refined way indeed. The wine list includes labels from local wineries, so as to taste the delicious and high quality wines of Santorini vineyards. 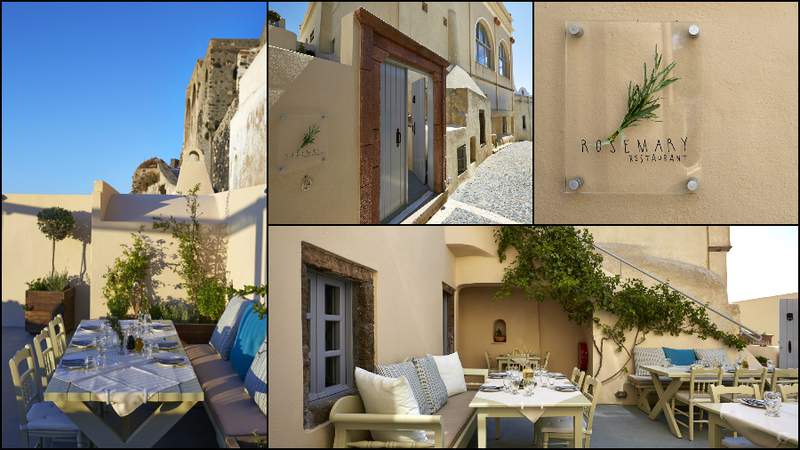 Delicious flavors, beautiful people, elegant plain space, and a breathtaking view… Create vivid memories during your trip to Santorini Island, by exploring the traditional village of Pyrgos, and visiting the Rosemary Restaurant!